A cross-media marketing company in Barnsley has invested over half a million pounds in bespoke new premises and equipment – and launched a strategy for growth in 2016. 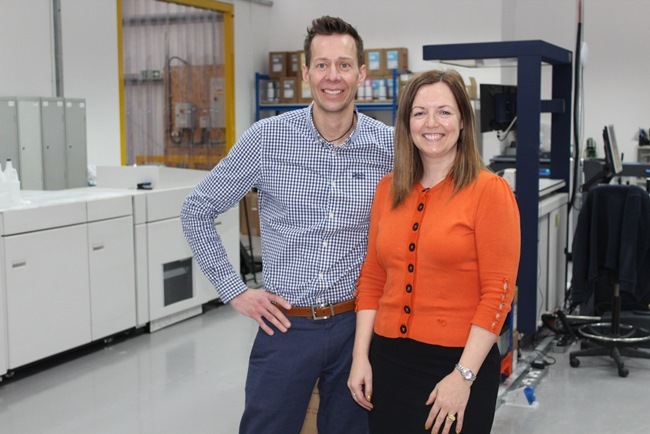 Rethink CMYK Ltd has moved into 10,000 square foot premises at Shortwood Business Park, near Hoyland in Barnsley, which is part of the Sheffield City Region Enterprise Zone. The company has invested £510,000 in fitting-out its new workspace, including a purpose built, climate-controlled press room that houses cutting edge digital print and production equipment. Established in April this year, the new enterprise is led by husband and wife team Joel and Amanda Dickinson, who each have more than 30 years’ experience in the media marketing industry behind them. Their move six weeks ago has been supported by Enterprising Barnsley, the business development arm of Barnsley Council. Rethink has already begun a recruitment drive to fill new posts in marketing, software development and accountancy. The next step in its business development is a further investment of £110,000 in additional software technology to create an integrated cross-media marketing platform for the delivery of complex marketing campaigns across printed and digital media. Rethink specialises in data capture, digital marketing, creative design and variable digital printing. It handles orders which range in size from a set of business cards for small local businesses to thousands of full-colour brochures for large national retailers such as Maplin. It designs and delivers focused and integrated marketing campaigns which may incorporate in-store loyalty and promotions schemes, SMS messaging, mobile customer apps, e-mail marketing, personalised website content and variable digital printing. Joel said: “The cross-media marketing industry has transformed in recent years with huge advances in digital technology and a far greater understanding of how this can be best used with a mind to rewarding the consumer. Rethink clients include Select and Save Convenience Stores and SIG Building Supplies. They recently produced personalised chocolate-filled advent calendars for the Woodland Trust which were delivered to members of the European Parliament in Brussels for the EU 2020 Biodiversity Strategy campaign. They also produced mock passports, tickets and boarding passes for a themed VIP event organised by global broadcaster CNN and hosted in London. Rethink’s expansion has been backed by grant funding from the Leeds City Region Enterprise Partnership (The LEP), secured with the help of Enterprising Barnsley, which is also helping with the company’s recruitment drive. Enterprising Barnsley’s business development manager Shaun Higginbottom said: “These are exciting times for Rethink. Joel, Amanda and the team bring a wealth of experience and expertise in the media industry to their new venture and a commitment to new technology and innovation too. Rethink is accredited with ISO 9001 for quality control, ISO 14001 for environmental standards and the ISO/IEC 27001 for its data protection and information security management. Enterprising Barnsley offers a wide range of business support to small and medium-sized businesses with growth potential.